BlueHost hosting is optimized for WP platform to deliver maximum performance, smooth user experience and stability. Check this review for more. BlueHost is one of the most famous and well-known WordPress hosting companies among bloggers, internet marketers, and businesses due to reliable and affordable services. They are operating since 10+ years and serving millions of customers around the globe and also stands in top 20 web hosting providers in the world. Another thing that makes them different from many hosts is they are also officially recommended by the WordPress.org as well as several influential bloggers like Pat Flynn and Ramsay Taplin recommend it to start a blog on WordPress platform. So, why BlueHost is so popular? Why bloggers and marketers love it? Why professional bloggers choose BlueHost for their websites? Well, there are many reasons to choose it and some of them I am going to share with you in this article. I also have more than two-year experience with BlueHost and hosting one of my sites on their servers. Being paid customer of BlueHost, I found 8 top reasons to choose BlueHost. At the end of the post, I will also share few cons that I hate you might also like to know. So, read this post till the end. They are serving the users for more than 14+ years and gained massive respect and popularity. Why millions of users using BlueHost to host their websites? Because they have quality hosting which comes with advanced features to fulfill almost all kind of users need, active customer support, account isolation technology to protect other users resources and deploy the latest innovation as soon as possible. They know how to deal with customers and what features they need the most. Implementing modern technologies makes them superior over others. For example; recently Google declared that it will pass some ranking signals to sites having SSL or HTTPS enabled and to fulfill this necessity, BlueHost introduced an in-house built one-click SSL enabling/disabling feature. So, their users can activate it without learning any technical stuff or pay extra fees to developers for this. BlueHost is quite popular for WordPress users, so also have exclusive tools for WP platform like plugins, themes, and core updater which can be used to update your site without visiting it. You can also take backups, modify URL, enhance performance, manage users, or delete website with WordPress tools. All of these features within affordable prices help them gain such a massive user base, and that is why over 2 million users trust them. If you’re blogging for a while, I am sure you’ll know what is WordPress and its benefits. To enhance your knowledge let me throw some facts. It is one of the widely used CMS and power up to 27% CMS based websites worldwide and continuously growing. Why? Because it is much flexible and customizable compared to its competitors such as Joomla, Magento, and Drupal. There is a giant real user community to help you fix any issue you might face and third-party independent developers. So, it means if you face any problem regarding WordPress, there will be sure solutions for that shared by other users, just Google it. And WordPress.org officially recommends BlueHost‘s WordPress hosting to build smooth running, error-free, and well-optimized WP-powered sites. They offer WordPress managed hosting plans to deliver maximum performance, usability, and reliability. They provide highly affordable and cheap WordPress hosting solutions to all, from beginners to intermediate, intermediate to expert, and sure for personal blogs as well. In fact, you can buy the basic plan under $3/month (shared). Though, you’ll have to purchase hosting plan for a longer period such as 3 years to avail maximum savings. But, if you choose one year subscription, it is still inexpensive for feature-rich WP hosting. If compared to others, many web hosting providers cost more than BlueHost. Due to low and reasonable prices, it is another reason why experts recommend it for beginners to start a website. Apart from affordability and low-cost hosting plans, you may surprise to know that they also offer you a FREE domain for one year. All of their packages come with a domain name at no extra costs which is a pure $12/year saving. But keep in mind, it is only for the first year, and new customers can take benefits from it. Still, good deal and make sense to choose BH. You can manage your free domain name right from the “domain” tab located in the main navigation after login to your BlueHost account. There you can change DNS, renew domains, and lock/unlock it if planning to transfer to other domain name registrars. SSL certificate or HTTPs protocol, whatever you like to call it, here is another awesome news. You can get a free SSL certificate for all of your websites hosted on BlueHost WordPress hosting server. Even, activating or deactivating is like eating cake. Just go to your account and head over to WordPress Tools tab located in the main navigation and then click on “Security” option in the left sidebar. There you just have to choose a domain for which you want to activate SSL. It will take few seconds to make your sites HTTPs enabled. If you’re going to start blogging journey or content marketing, then it is highly recommended you must implement SSL certificate on your website. Google already announced that its search algorithm will pass ranking benefits to HTTPs enabled sites than non-HTTPs. So, why not take some search benefits when it is totally free and easy to implement? Tip: If you have a non-HTTPs site and now enabled SSL, you must modify “Google Search Console” and “Google Analytics” settings for proper indexing and tracking. Otherwise, you might face problems regarding crawling, indexing, and analytics. When it comes to the digital world, who knows when he/she is going to encounter a problem regarding their website or blog. In blogging, not everyone is a tech-savvy and most users find it difficult to learn coding, technical things, and web server stuff. But what you will do in the case of problems? What will be your first step to make things work the way as these were before? If you have know-how about servers, chances are you may find some solutions. On the other hand, most non-techy users usually just decide to contact the support staff for instant help. That’s why as an experienced blogger, I insist every user and beginner choose a web hosting that offers 24/7/365 support via multiple ways such as phone call, live chat, email, and ticket system. With BlueHost, you get an instant and quick customer as well as technical support through all of the above mentioned ways. They take only a few minutes to get connected via live chat and fix any issue you might face or help you answer your queries. In web hosting, having great support is essential, and it can be a deal breaker for any company which lacks proper supporting channels. This is another reason to pick BlueHost WordPress hosting if quick customer support matters to you. I have explained many features, benefits, and reasons to choose BlueHost but if all of those failed to convince you to choose them, then here is another best thing – 30 days money back guarantee. Yes, you can try their services for a whole month to check if they worth your money. And I guess, a month is more than enough to analyze any service for finding its pros and cons. If they failed to satisfy or you don’t get what you had in your mind at the time of purchase, just ask them for the refund. They might ask for reasons why you decided to refund and try their best to fix them but at the end of the day, will refund your money if you don’t want to use BlueHost anymore. It’s that simple. Note: Here keep in mind, if you purchase a domain or get a free domain registration at the time of web hosting purchase, they will deduct the domain fee because it is non-refundable. They give free domain name only when you buy hosting plan for at least one year. Web hosting companies advertise the lowest price tag on their marketing campaigns and homepage, same goes with BlueHost. You may notice $3.97 per month price on their website, click here for example. But it is only possible when you choose 2 or 3-year subscription, in other words, you must choose 3-year plan to get maximum discount. For maximum savings, it is recommended buy long term plan as it cut the cost by fifty or sometimes eight percent than normal price. But, I hate it, why should I buy for 3 years when there is only a 30 days refund policy? What if I found them worthless after six-months or a year? I will lose all of my advanced paid money for future months, am I right? Recently, Bluehost closed their pro-rated refund policy. Upselling is not a new technique by hosting companies, though its good from the marketing perspective to sell other products related to your current one. For instance; while buying a domain name, registrars try to sell WHOIS guard or privacy protection which is entirely logical. BlueHost also use similar marketing practices to make more profit which is fine with me, but some users may find it annoying. But unlike many hosts, they don’t do it aggressively and suggest highly recommended services such as backup service, etc. The problem is they automatically tick few products which is a shady tactic. So, unless you manually remove those ticks, you will be on the safe side otherwise you may end up paying extra charges for services you might never use. So, before checkout, check your cart carefully and make a payment. I know I mentioned this earlier, that they are quick and offer instant support round the clock. But they need improvements. Why did I say that? Let me share a personal experience. Around a year ago, I bought one of their plans and installed WordPress. It took me roughly 1 minute to install WordPress via one-click installer. But soon after, I had one problem – downtimes. I contact the support, and you know what they said, upgrade your plan as your site is consuming high resources that is why you’re facing this. Wow… a site I just create a few days ago having not more than 10 visitors per day need a high resourceful plan. That was frustrating 🙁 after contacting again a few days later; they said that there was an issue in the server and it’s fixed. It happened once, and I thought why not to share with you. What I learned is, if you have an issue and your hosting support suggests to upgrade to the higher package, just inspect your site thoroughly and figure out which part of your site (PHP, Java scripts) is taking too much server resources and fix it. No matter if it’s a small or big site, just do it before upgrading to a higher package. 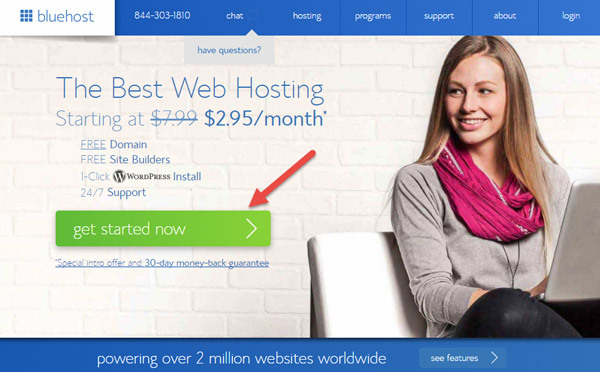 Now I have shared pros and cons, here is a quick guide on how to buy web hosting from BlueHost? No matter if you buy Managed WordPress or shared hosting, either way you’ll get access to “WordPress Tools”. So for guiding purpose, I’ll share shared plan buying steps because the process is quite similar for managed plans as well. Here choose a plan which suits your requirement. But, I suggest considering “Plus” because it comes with unlimited storage, bandwidth, and allow hosting unlimited websites as well. If you’ve limited budget, then go for “Basic” or don’t have plans to host more than one website in the near future. As you get a FREE domain name with each plan, so enter your new domain name for registration or if you already have one then enter it in the box “I have a domain name”. Next, fill your account information such as name, email, country, address, phone number, etc. Below account information form, you will see another section named as “Package information”. There you’ll have to choose the duration for which you need hosting plan (like 2 or 3 years) and add-ons. Untick Domain Privacy Protection, Site Backup Pro, and SiteLock Security because mostly we don’t need these. Provide payment details, you can buy through credit card or choose “more payment methods” for PayPal. Finally, tick the option “I have read and agree to BlueHost’s terms of service” and make a payment. 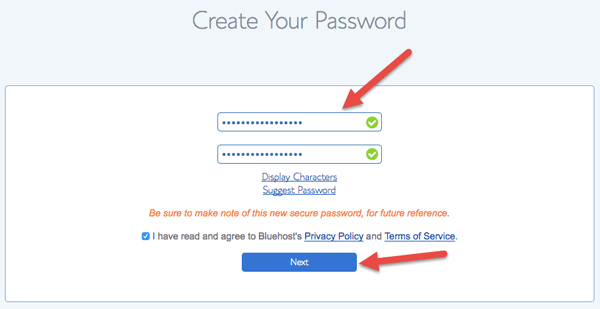 Before login to your newly created account, you’ll have to create a password for BlueHost hosting account. For that, follow below steps. After creating a password, if you had chosen “Managed WordPress Hosting” then they will pre-install WordPress and provide you a link to your WordPress website with username and password. Otherwise, you can install the WordPress via one-click installer, it takes roughly a minute. 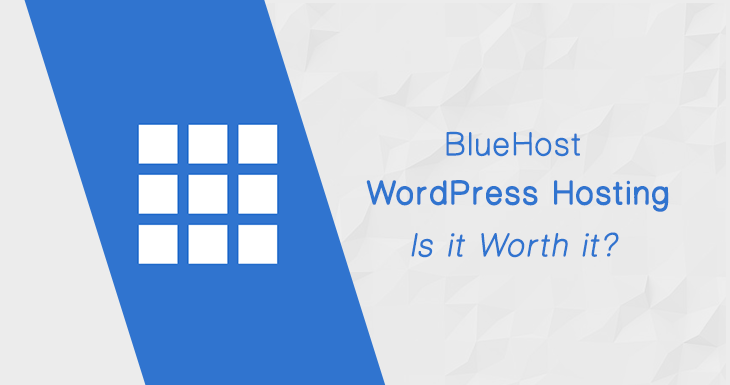 Should You Buy BlueHost WordPress Hosting? As a user of BlueHost for over two years, I can’t resist myself to recommend them. They deliver pretty unique uptime (99.9%), site loading speed and essential features at the affordable prices. Their custom designed control panel comes handy to create email accounts, review statistics, modify DNS, and other settings easily. Also, WordPress tools provided by BlueHost help you install the WordPress as well as SSL certificate within few minutes. You can take backups or restore with few mouse-clicks. The overall usability optimized for users ease, so you can do anything to manage your account. For more details, you can visit BlueHost here, I hope this BlueHost WordPress hosting review will help you decide whether they worth using or not and everything you need to know before buying.